Daisy Henderson was a soprano in the full-time of chorus of Scottish Opera from 1996 - 2005, at which time the chorus was made redundant. She continued to be employed by the company on a freelance basis, in addition to teaching singing privately, and at the same time, sang as a soloist around Scotland, and with Opera Alba, Coro Alba, Trio Serenata, and latterly with The Ivor Novello Story. While she was managing these groups, she felt she might try to represent some other musicians as well, and in April 2011 she created her own website, following on in July 2012, with a professional website www.classicalmusiciansscotland.com where she now represents over 60 of the best performers from, or currently based in Scotland. The CMS performers are singers/instrumentalists, soloists/ensemble players and perform in recital, in concert, in opera, at music festivals, at corporate functions, for charity/fundraising events and on special occasions of any kind where quality musicians are required. While primarily performing in Scotland, many of the performers represented have worked extensively in the rest of the United Kingdom and in Europe. The Fejes Quartet formed when the members met while working with the Royal Scottish National Orchestra. They currently have residencies at the Glasgow Art Club and at the Mackintosh Church in Glasgow. They’re currently completing their second CD and have plans for concerts in August/September 2013 which include inviting Marco Scolastra, classical pianist across from Italy to play with them as a piano quintet. “...the same energy that later manically powered the Shostakovich catapulted the Haydn - which came out of the bottle like a champagne cork - into effervescent action." Outstanding cellist, Robert Irvine, well known for creating an immediate rapport with his audiences through his lively and informal introductions, comes together with guitarist, Allan Neave, one of the foremost classical guitarists of his generation. Two musicians of remarkable sensitivity and authority delight audiences with a diverse repertoire ranging from the stately baroque to the fiery passion of Spain, the Americas and beyond. Both musicians were born and raised in Scotland and after performing worldwide, now teach at the Royal Conservatoire of Scotland - Allan as Professor of Guitar and Harp and Robert as Head of Cello Studies. They still perform and record regularly, both as soloists, together as a duo and with other ensembles. As a duo, they are much in demand, not only for the quality of their playing, but also for their wonderfully humorous introductions, which are an integral part of their personalities and performances. "...This versatile ensemble took us through every range of emotion in the varied content of the programme, with amusing and engaging commentaries linking each number. A combination of solos, duets and the beautifully blended voices of the full ensemble ensured a thoroughly entertaining evening..."
" an effervescent evening! Coro Alba gave us a concert of emotion, joy and sparkle. The singers were totally professional and the accompanist was superb. The programme of operatic arias and excerpts from musicals was well chosen and delivered in style." Trio Dalriada, mezzo, guitar, violin. Beth Mackay, mezzo, Ian Watt, guitar, Paul Livingston, violin. Trio Dalriada present a lovely programme of music by Roger Quilter, James Oswald, Britten, Respighi, Debussy, albeniz, Paganini , Bizet et al. They specialise in arrangements of Scottish pieces for this unusual combination of musicians. From a script by John Cairney (by special arrangement with Samuel French Ltd), this show has charmed audiences across Scotland and will be performing at the Edinburgh Festival Fringe in August 2013. A story about a Welshman, who was thought of as being English, performed by four Scots! In this wonderful script by John Cairney, Scottish writer, actor, artist and raconteur, Ivor Novello’s story and songs are brought to life by an actor, two singers and a pianist. Nostalgia, romance and showbiz glamour away from the rush-hour traffic. Feargus Hetherington has developed a wide ranging and varied career as a chamber musician, soloist and orchestral player. He also presents musical workshops and seminars, arranges music and is a highly accomplished viola player. Feargus studied at the RSAMD (now the Royal Conservatoire of Scotland) and the Cleveland Institute of Music, USA, and has worked with some of today’s great performers. He has performed in renowned concert halls in the UK, and abroad he has given concerts in Denmark, Sweden, Germany, Ireland and North America, giving his New York recital debut in June 2010 with American pianist Steven Beck. He enjoys a successful collaboration with US based, Belarusian-born pianist Olga Gorelik. Feargus has been guest leader of orchestras and chamber ensembles in Scotland and the USA and has participated in performances by leading orchestras including the Scottish Chamber Orchestra. In March 2009 Feargus took part in the educational element of the Abu Dhabi Music and Arts Foundation’s festival, mentoring young musicians. In 2011 he worked with the Scottish Ensemble on the ‘Music for Change’ project in Polmont Prison. He has participated in many first performances of new compositions by Scottish composers with Ensemble Symposia and Red Note Ensemble. He has recorded and performed for BBC Radio 3, BBC Scotland and BBC Ulster. 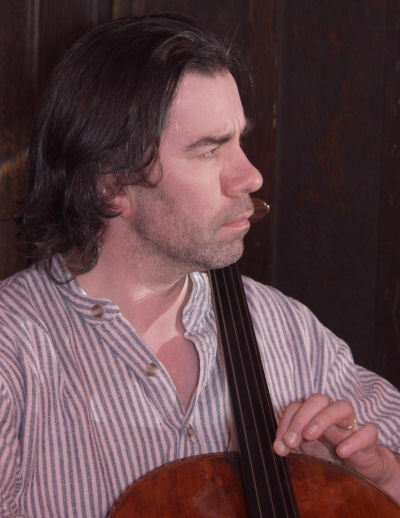 In 2009, as violist, Feargus joined the Roxburgh Quartet and in 2010, he was appointed an associate teacher in violin and chamber music at the University of St Andrews. Feargus has developed an interest in exploring the relationship between Scottish traditional music and the European ‘Classical’ tradition, giving lecture/recitals on this subject entitled ‘McGibbon to Mackenzie’. He recently recorded this repertoire with pianist Mira Opalińska for a forthcoming CD release on Natural Studio Records. Collaborations with other musicians include Meall a’Bhuiridh (‘Hill of the Bellowing’) by Barry Reid and An Aifreann Ghaidhlig (Gaelic Mass) by Blair Douglas. Feargus researches deeply the scores he performs, and has arranged works for his chamber music colleagues – including works by Copland and Satie – and composed stylistically appropriate cadenzas to Mozart’s Violin Concerti. His interests extend to improvisation, and the study of harmony and temperaments. 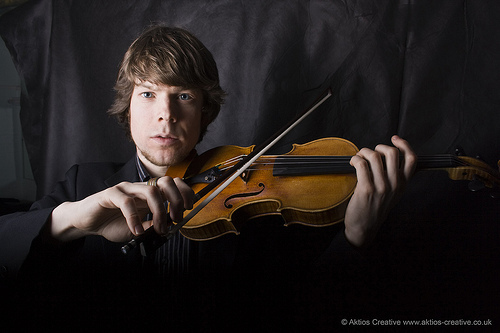 In 2009 Feargus attended the Starling-DeLay Symposium on Violin Studies at the Juilliard School, New York, given by professors including Monica Huggett, Itzhak Perlman and leading performance psychologist Don Greene. In August 2011, he took part in the Unity Hills Arts Center’s seminar in Vermont, USA, studying with conductor and violinist Joseph Swensen supported by the Musicians Benevolent Fund’s Professional Development Awards and the University of St Andrews. He returned there in the summer of 2012 with assistance from Creative Scotland’s Professional Development Awards Scheme. He has recently released his Highland Ballad CD, featuring works by Scottish composers. The composer of the music entitled “Airs for the Seasons” is Scotland’s most famous 18th Century composer James Oswald, who was born in 1710 and died in 1769. I listened to a recording of his 48 Floral Suites each representing a particular shrub or flower, played by the Broadside Band. For the summer season, the plants Oswald selected were Veronica, Myrtle, Heliotrope and Poppy. In 1755 when he composed them, Oswald had moved from Scotland to London, so he probably saw these summer bloomers growing there. He had a lucrative career as a teacher in London, and in 1742 he published his most popular work the “Caledonian Pocket Companion,” which includes tunes for the lyrics of Robert Burns. He was granted a Royal Licence to set up his own publishing shop and office to print his own compositions. He was the most prolific Scottish composer of his time and popularized many Lowland Scottish melodies. He loved to recycle traditional old tunes. Each of his lovely airs for the flowers of spring, summer, autumn and winter has a distinct and recognizable style. In 1781 he was appointed Chamber Composer to the English King George the third. “In memory of the Right Honble. 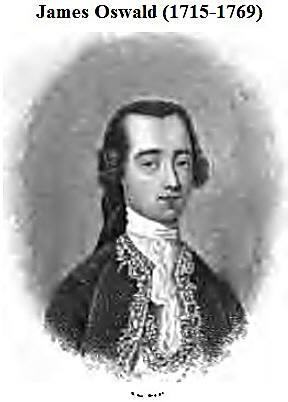 James Oswald of Dunniker, the friend of David Hume and Adam Smith, Lord of [the] Treasury and Treasurer of Ireland, M.P. for the county of Fife, Lord of Trade and Plantations, Commissioner of the Navy. Born 1715, died 1769. This memorial was placed over his remains by his great grandson James Townsend Oswald of Dunniker, Fifeshire and other of his descendants in the year 1871. The site of the grave is in the north aisle, ten feet from the centre of the step of the doorway going into the grassplot”. James’s father was James Oswald the younger of Dunniker, Fife, Scotland and his mother was Anne (Durie). She was born 7 September 1698 and married James in 1714. She died at her son’s house in Westminster 29 March 1762 and was buried in the west cloister of the Abbey. James was born in 1715 and baptised at Kirkcaldy. He was educated at Edinburgh university and became a lawyer and Member of Parliament for Kirkcaldy burghs. On 19 January 1747 he married Elizabeth Reynardson (nee Townsend). She died 20 September 1779 and was buried with him in the nave, aged 80. Their only child was James Townsend Oswald, who succeeded his father as M.P. and married Janet Gray. One of their sons, George born 6 May 1779, was in the Civil Service of the East India Company. He died unmarried aboard a ship returning from Bengal and was buried in the nave on 12 June 1819. George’s niece, Lady Augusta Bruce, married Arthur Stanley, Dean of Westminster, in the Abbey and is buried in Henry VII’s chapel. Ann Oswald (nee Buchanan), who died 13 February 1785 aged 65, was the wife of the Revd. Dr John Oswald, a prebendary of Westminster 1755-62 and later Bishop of Clonfert, Dromore and Raphoe in Ireland. She was married in 1755 but seems to have had no children and was buried in the nave (her husband is buried at Raphoe). Two examples of James Oswald’s classical music [converted into Mono Wav files to avoid possible copywrite] played by ‘Da Camera’. It was many years ago when I first began exploring eighteenth-century Scottish music. Having been steeped in the more typical Baroque repertoire for my instruments, I was always on the lookout for more esoteric musical fare; and as a first-generation Canadian with ancestry in Port Glasgow and Dundee, perhaps it was genetic. But my chief reason was that I found many old Scots tunes beautiful and very touching, qualities as admired nowadays as they were in the eighteenth century. I wondered how these tunes might have been played three centuries ago, and what other music had been composed for the flute and recorder. This recording offers a small sampling of the repertoire I came across; I hope you have as much pleasure in the listening as my colleagues and I had in the playing. As seems to have been the case in most of Western Europe, the gulf between ‘art’ and traditional music in 18th-century Scotland was not as wide or un-navigable as it became by the early 20th century. Many Scots musicians, such as John Clerk of Penicuik who studied with Corelli in Rome in the late 1600s, composed in a typical Baroque style and produced sonatas, divertimentos and ‘setts’ of Italianate or French influence. Most were also familiar with Scottish traditional music, both vocal and instrumental, and many tried to blend both styles with varying degrees of success. Most common was the attempt to arrange traditional airs in an ‘educated’ style, adding figured bass parts and/or secondary melodic lines; even non-native composers resident in Scotland, such as Barsanti, Schetky and Corri, made use of this approach. But adagios reminiscent of slow Scottish airs and reel-like allegros can occasionally be found in the sonatas of John Reid, James Oswald and others, bringing a distinctive Scottish flavour to what otherwise sound like typically Italianate works. The collecting of Scots tunes began in the 17th century but blossomed following Scotland’s Union with England in 1707. The loss of their own Parliament spurred the Scots to protect their cultural heritage in whichever ways they could; and ironically enough, Scottish music grew enormously popular in England. For well over a century, the demand for Scottish instrumental and vocal music fuelled tremendous publishing activity in Scotland, England and abroad – the Scottish song arrangements by Haydn and Beethoven are some of the more celebrated examples. Some very large collections appeared, such as Robert Burns’s Scots Musical Museum and James Oswald’s Caledonian Pocket Companion, as well as collections by MacIntosh, McGibbon, Baillie, Foulis, Erskine, Macklean, Watson, Bremner, Ramsey, Rick, Craig, Campbell, Schetky and innumerably more. Most of these collections were printed for voice or violin, and many included only the tunes, sometimes with variations. The Scots Musical Museum and various other publications included the song texts and figured bass parts; still others provided slow air tunes without words but set with figured bass for performance on the harpsichord or other instruments. However, it must be said that applying ‘educated’ rules of harmony and metre, not to mention tuning and temperament, significantly alters the nature of these tunes, and playing from these arrangements clearly produced a result very far removed from ‘traditional’ performance. As for music written specifically for the flute, which was a popular wind instrument throughout the eighteenth century, sonatas appeared by Munro, Macklean, John Reid, Barsanti; Oswald composed a set of divertimentos; and sets of flute duets were prepared by McGibbon, Schetky, Montgomery, Muschat, Oswald and others. James Oswald was one of Scotland’s bright lights in the 18th century, making a career first in his hometown of Dunfermline and in Edinburgh before moving to London in 1741. Appointed chamber composer to George III in 1761, and a member of the Society of the Temple of Apollo, he worked as a musician, composer, teacher and music editor. His Caledonian Pocket Companion was a multi-volume collection of Scots tunes for violin or flute solo published between about 1742 and 1759. Variations on the tunes are often included, especially in the earlier volumes. Forty-seven of the tunes in the CPC also appeared in a version with figured bass around 1742 (a modern edition of this is available from Ut Orpheus, Bologna). This recording features seven of the CPC’s tunes as solos, and an eighth (Greensleeves) accompanied in an arrangement created by my colleagues. ‘A rock and a wee pickle Jon,’ ‘Lovely Nancy‘ and ‘My aprone dearie‘ are some of the most popular tunes of the time, found in many collections; ‘The Braes of Ewes‘ is a tune of Oswald’s own composition. James Oswald also composed numerous works for various instruments, including two large sets of sonatas called ‘The Seasons.‘ Each ‘season’ consisted of several short sonatas, each named for a particular flower or plant. The selections on this recording come from the second set, published in 1747. I seem to have gravitated to some unusual botanical subjects: the Sneezewort is a species of yarrow once used as a substitute for snuff; the Duck’s Foot is more commonly known as the May apple; and blue Heather Bells are amongst the most beautiful of wildflowers in the northern U.K. The short and sweet sonatas by Charles Macklean are two of the four specified for flute in his ‘Twelve Solo’s or Sonata’s,’ op. 1, published in Edinburgh in 1737. Macklean, who worked in Montrose, Aberdeen and Edinburgh, also set a number of traditional tunes as part of a collection published posthumously in 1770. Nicola Matteis’s ‘Ground after the Scotch Humour’ comes from his Ayrs for the Violin (1685). Matteis was a brilliant Neapolitain violinist who came to London around 1670. 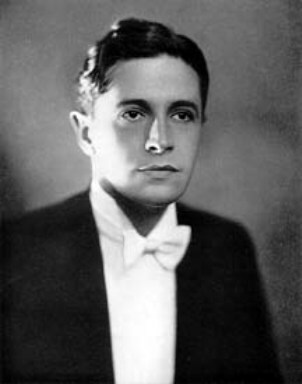 During his early years there he performed very little, allegedly because he was ‘inexpugnably proud,’ but he was later described as ‘stupendious’ by Evelyn, and considered a second Corelli by North and Burney. For examples of slow airs set to 18th-century figured basses, arrangements by Barsanti and Edward Miller are included here. Padua-born Francesco Barsanti, who lived in Edinburgh from 1735 to 1743 and is better-known to recorder/flute players for his sonatas, adapted many Scottish slow airs in various arrangements for vocal and instrumental performance. ‘The Braes of Ballandyne‘ is taken from Edward Miller’s flute instruction method of 1799. Captain Simon Fraser’s collection of ‘The Airs and Melodies Peculiar to the Highlands of Scotland and The Isles’ was assembled between 1715 and 1745 but did not appear in print until 1816. A record of Gaelic songs as sung by his older relatives, the tunes were set in very simple keyboard arrangements, presumably to be useful to as wide a spectrum of music lovers as possible. The accompaniments recorded here, created by my colleagues, are significantly more inventive than Fraser’s. Two tunes by members of the illustrious Gow family of fiddle players have also been included here, simply out of respect for their influence on Scottish music. ‘Bannocks of Beer Meal‘ is a melody featured in numerous collections, and the variations on it come from Robert Bewick’s manuscripts of tunes for Northumbrian small pipes. Bewick was a celebrated pipes player of the early nineteenth century, and also produced excellent copperplate engravings. The CD’s final tune comes from an anonymous 18th-century collection at Edinburgh’s National Library of Scotland (MS 2833).